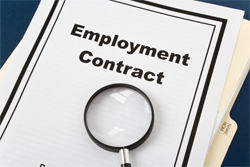 The firm counsels and represents regional and national employers in all matters related to labor and employment. Specific matters include health and safety, discrimination, retaliation, wage and hour, leaves and absenteeism, personnel policies, federal contractors, noncompetition, confidentiality and duty of loyalty, employment contracts, unemployment benefits, reductions-in-force, disciplinary actions, investigations, training, vacation, final paycheck, workplace torts (defamation, invasion of privacy, etc.) civil rights issues and others, whether relating to EEO (including Title VII, ADA, ADEA, etc.) FMLA, FLSA, OSHA, ERISA, OFCCP, state or federal law or regulations, or general business practices. The firm represents clients in mediations, negotiations, arbitrations, state and federal courts and at all levels of administrative proceedings.